When planning your next Trail getaway, consider choosing the small city of Cranbrook in southeastern British Columbia as a base. 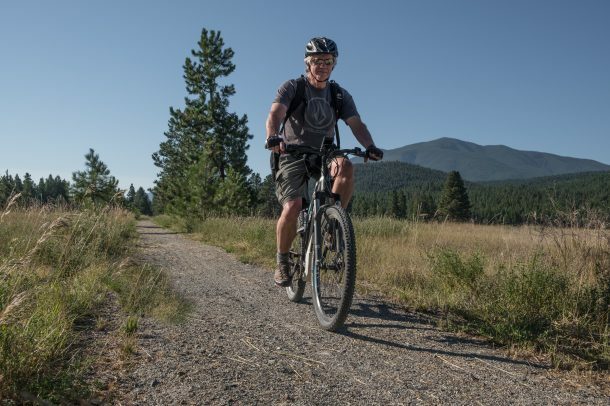 Connecting the rail-grade ease Chief Isadore Trail and the scenic beauty of the North Star Rails to Trails, this small city in the Kootenays is a must-visit for cyclists exploring western Canada. Discover the natural beauty and rich heritage of Cranbrook and its surroundings with this two-day journey. Start your day with breakfast at Soulfood, an organic-focused café and restaurant in the heart of Cranbrook. Their delicious breakfasts, made with local produce, will satisfy your hunger before your outing on the Chief Isadore Trail. 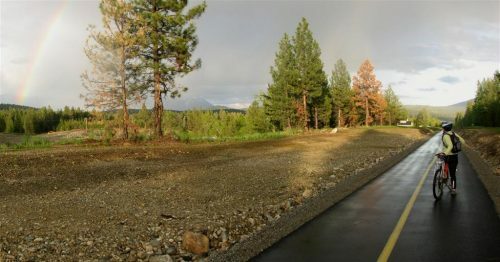 Begin your Trail journey at the Isadore Canyon trailhead at the entrance of Cranbrook Community Forest, and follow the Trail as you take in views of the Steeples and the Rockies. If you want to take a short break, follow the Rampart Rest Area Loop. 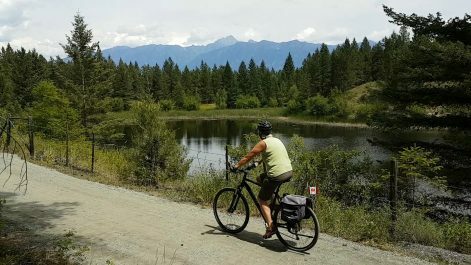 This easy seven-kilometre hard-packed gravel path connects the Rampart Rest Area along highway 3 with the rail grade of the main Chief Isadore Trail in an easy six-kilometre loop, passing by several small ponds. Stop by the rest area and enjoy a packed lunch and some water, before following the loop back to the main Chief Isadore Trail. In the mood for a more strenuous cycle? Continue to the Mayook Trail, a fun 17-kilometre section of the Chief Isadore Trail that begins at the Pritchard Road trailhead. The Mayook Trail leaves the old rail-grade and climbs 200 metres over the course of eight kilometres, gaining elevation from both directions to a midway high point, where you can stop for a snack or to take photos. Ride up and down this trail, which has sustained grades of 5%. It’s a winding section with an enjoyable, easy downhill run. Once you reach the trailhead at Ha-Ha Creek Road, turn back and return to Cranbrook. As you explore the Chief Isadore Trail, you’ll find numerous kiosks explaining the history and geography of this stunning area. You’ll also discover a number of interpretive signs explaining the customs and heritage of the Ktunaxa Nation, which TCT helped to develop in partnership with the local Indigenous community. Settle into your first night in Cranbrook with dinner at Allegra, a Mediterranean-themed restaurant on Cranbrook Street North. After treating yourself to a tasty breakfast and coffee at Hot Shots Café, get ready for your next day on the Trail, beginning at the North Star Rails to Trails trailhead. This 28-kilometre paved Trail section runs parallel to the highway, then dips down through the forest before crossing the St. Mary River on a restored railway bridge. The North Star Rails to Trails follows the former rail grade that used to service the Cominco Mine in Kimberley. The mine closed in 2001 after over 100 years in operation. Ten years later, the North Star Rails to Trails opened as a non-motorized connector between the two East Kootenay Cities. 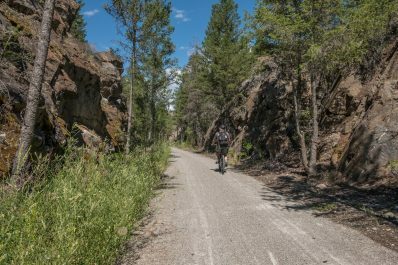 The trail climbs up to Wycliffe and through prairie, where you can enjoy some of the best views of the Rocky Mountains to the east and Purcell Mountains to the west. Take a few moments to park your bike and admire the stunning views around you as you cycle towards Kimberley. At the end of this Trail section, congratulate yourself on reaching one of the highest cities in Canada! At 1,113 metres, Kimberley is often called the Bavarian City of the Rockies. It’s also an ideal spot to refuel after your cycle. Wander to the Platzl shopping area, where you will find eclectic stores and quirky restaurants and cafés to grab lunch. For a hearty mid-cycle meal, The Shed is a local favourite. Once you have taken time to rehydrate and refresh yourself, get back to the Trail and enjoy a fun, downhill ride to Cranbrook. Take time in the evening to rest, before getting dinner and a local craft beer at The Heid Out Restaurant on Baker Street in Cranbrook. Fly to the Canadian Rockies International Airport (XYC) with a number of airlines. Alternatively, drive into Cranbrook via highways 3 or 95. With beautiful views of the nearby Elizabeth Lake conservation area, Elizabeth Lake Lodge offers rooms with full kitchens and comfortable queen beds close to the trailheads.